I've been on a kick lately. A kick of propping up Southern Ohio and the rugged, steep terrain that is to be had here. I guess in some sort of way, I am trying to justify my sense of actually being able to train for mountainous, rugged races. My training may not translate to do well in these races, but I like to crunch the numbers and find correlations. I'll never be able to find the altitude, or the long sustained 5 mile climbs, but I believe I can find the total elevation gain if I try hard enough. 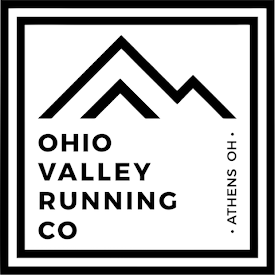 A lot of ultra runners don't know much about Southern Ohio, so I'm going to try to write this post to highlight what I love so much about it!. Southern Ohio doesn't have a mountain as far as the eye can see. In fact, the high point of the largest hill in Southern Ohio sits at a mere 1350 feet. In Athens, where I do a lot of running, that highest point is just 1070 feet. A small bump of altitude compared to the 14,000 foot summits in Colorado or even the 6000 foot mountains along the Appalachian Mountain range. I would like to know exactly what Lazarus Lake was thinking when he set out to create what is now considered the hardest 100 mile race course in the world. There is a reported 59,100 feet of elevation gain for the 100 miles. That is about 26,000' more than Hardrock, which is also considered one of the hardest 100 miles races in the world. Some might say that I really don't want to know what Laz was thinking, it is to cruel of a place to go and those thoughts are reserved for only crazy people. However, I keep thinking about how the hardest 100 mile course is not in Colorado, and it's because someone sought out to do something that is a little crazy and non-traditional. The Barkley course is not traditional, and some runs I do in Southern Ohio are not traditional in the same way, but it gets you the element a lot of people are seeking. Lets look at some statistics that might not mean much, but sort of drives my point across. Lets take sections of different courses/routes, find the stoutest hill/mountain on an elevation profile, and run up and down that hill/mountain until we get to 100 miles. Can you guess where these five scenarios come from? These stats come from either .KML files of race courses that I have obtained or actual runs that I have run. The .KML files are then overlayed on Goggle Earth. Scenario #2 comes from a trusted written account from an online blog where the author quotes the Race Director. Granted, this data may not be 100% accurate, and not 100% the "best" scenario, but I'm not a GPS and GIS expert, so don't hold me too it. To get 100 miles, I would need to run up and down this stretch 50 times. In total, I would gain 150,000' of elevation. To get 100 miles I would need to run up and down that stretch 56.82 times. In total, I would gain 90,912' of elevation. Gain 240' in .17 miles - running up and down makes it .34 miles. To get 100 miles I would need to run up and down that stretch 294.11 times. In total, I would gain 70,586' of elevation. Running from 10,423' at 27.9mi. to 14,026 at 31.4mi. To get 100 miles I would need to run up and down that stretch 14.29 times. In total I would gain 51,401' of elevation. Running from 2127' at 4.79mi. to 4462' at 8.85mi. In total I would gain 28,767' of elevation. Scenario #1 is from the 3,000 foot incline starting at the rocky gulch drain on the West side of Mt. Elbert to the summit just one mile later. This is the incline of the Nolan's 14 route. Scenario #2 is a depiction of The Barkley Marathons course grabbed from Matt Mahoney's website where he quoted race director Lazarus Lake. He described this hill in that post. Scenario #3 is in Southern Ohio! This hill, though only gaining 240' feet is only .17 from the bottom to top. I run this hill frequently and multiple times when I really want to hurt. Scenario #4 is from the Hardrock 100 course, running up to Handies Peak from Road. #30 on counter-clockwise years. 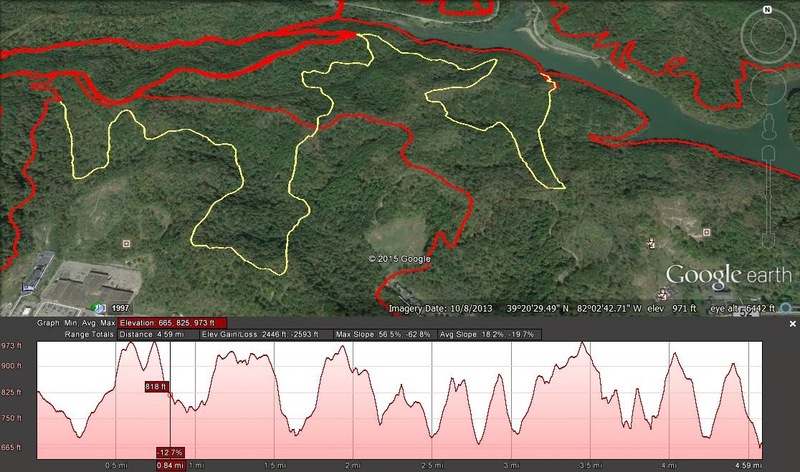 Scenario #5 is from my most recent race, Grindstone 100, running the steep gravel road up to the summit of Elliot's Knob. What Southern Ohio does not have in long sustained climbs, it makes up for in short, very frequent and steep climbs. An elevation profile of most trail runs in this area look like a jagged saw blade. In Colorado, after running up a mountain for 5 miles, you usually run down a mountain for the next 5 miles. In that 10 mile span, you will have already crested 25 hills in Ohio. I'm not trying to prove one region of the U.S. as any better than another when it comes to training. Each place is its own and has many benefits. I love running up mountains as much as the next person. And as we can see from the scenario's from above, you could do some serious elevation gaining if you ran up and down the West side of Mt. Elbert over and over... way more than you could get anywhere else. However, when you approach things a little differently, do something a little out of your comfort zone, a whole new world can open up! Southeast of Longs in Colorado. At some point in time, someone had to of run up a mountain for the first time. This might have seemed like breaking the norm, pushing through a new barrier. Now, running up mountains is really common. In the same way, I have been really into a new form of running here in Southern Ohio. I call it Ridgeateering. I am doing it more frequently, but still only once or twice a week, and in some way I feel a bit goofy out there doing it. But, after each time, I am left feeling drained but invigorated! Every once in I while a get a friend or two convinced to do a trip with me. In short, Ridgeateering has two principles: seek the most hills and do it in the shortest distances. This means getting off of designated trails and into the deep hollers that people don't frequent often, and when you get to a ridge, instead of running along the top, drop off the other side and go up the next hill. Obviously, this presents a moral dilemma of not being environmentally friendly. Trails are in place to get people contained and getting off trail has possible negative impacts on the land and nature. I try to be apathetic to this dilemma and I wouldn't want the masses to be doing it. The best time to do it without impacting the land as negatively is during winter and when the ground is frozen. Plus, you have a clearer forest without the overgrowth. If I had more of a decision in land use management the trails would be designed to get this sort of terrain, but they follow valleys, take a long time to climb to the ridge, then stay on the ridge for a long time. That is the traditional trail design method. In the Google Earth image below, I've plotted and ran a new trail that is highlighted in pale yellow. The red lines are pre-existing trails at Strouds Run State Park in Athens, Ohio. The elevation profile of the pale yellow line is also shown, and it gains almost 2500 feet of elevation in 4.6 miles. This is about 7-times more elevation gain than a typical 4.6 mile trail run on the pre-existing trails. There is really no way of getting this sort of elevation gain without Ridgeateering. So there you have it, my environmentally immoral, non-practical, sub-standard attempt of reaching new elevation gains in Southern Ohio! Okay, so it's not too bad, at least, I hope not. But I do hope to show that you can go out and do something non-traditional and not loose out one doing some really grueling and exciting things, even if you don't live in the mountains. I always like to eek out every bit of what a place has to offer, explore every low point and every high point in the forest, and see what I can make of it. In the past year, I've made ridgeateering and it's been a lot of fun! 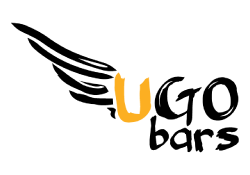 And as a fitting ending, I'll give a shout out to my newest sponsor UGo Bars! They have a great slogan of "Where Will UGo Today?" that I think we all need to seek to answer with exciting and adventurous stories. The great folks, and avid adventurers, at UGo make such a healthy, whole, and fresh energy bar for athletes. They are a Midwest company from Bloomington, Indiana and it's an honor to represent UGo and join a stellar crew of other athletes! #WhereWillUGo? I'm super stoked to announce that I'll be partnering with a couple brands for the 2015 year! It is always nice to have the support of trusted companies as I train and race in Mountain Ultra Trail Running and that is exactly what Swiftwick and SOSRehydrate is. 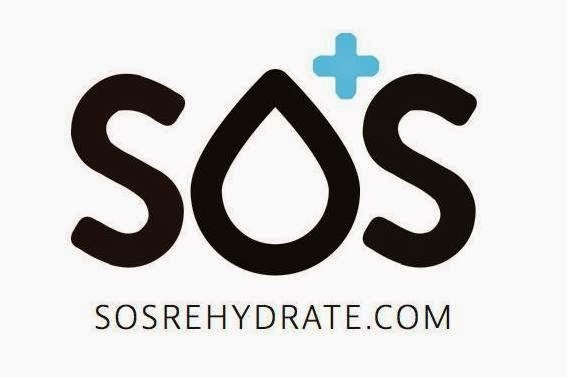 Check out Swiftwick for awesome socks and SOSRehydrate for your hydration needs. Follow their social media sites - click on their logo for their website!